Look at the picture graph given. How many roses are there in the graph? How many sunflowers are there in the graph? How many lotuses are there in the graph? How many marigolds are there in the graph? Which two flowers are the same in number? question_answer6) Look at the picture graph given. Now, answer the following questions. 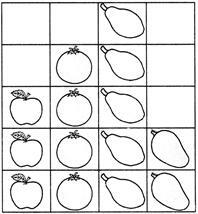 Which fruit is the least in number? question_answer7) Look at the picture graph given. Now, answer the following questions. Which fruit is the most in number? question_answer8) Look at the picture graph given. Now, answer the following questions. Which fruit is more in number than apples but less in number than papayas? question_answer9) Look at the picture graph given. Now, answer the following questions. How many more papayas are there than apples? question_answer10) Look at the picture graph given. Now, answer the following questions. How many less mangoes are there than oranges? question_answer11) Look at the picture graph given. Answer the following questions. 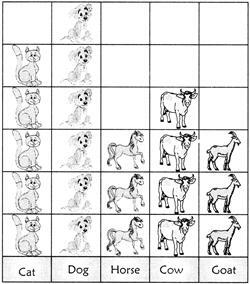 Which two animals are the same in number? question_answer12) Look at the picture graph given. Answer the following questions. How many less number of horses are there than dogs? question_answer13) Look at the picture graph given. Answer the following questions. How many more number of cats are there than cows? question_answer14) Look at the picture graph given. Answer the following questions. Which animal (s) is the least in number? question_answer15) Look at the picture graph given. Answer the following questions. How many are there in the graph? question_answer16) Look at the picture graph which shows the number of shells collected by four friends. Answer the following questions, based on the picture graph. Who collected the least number of shells? question_answer17) Look at the picture graph which shows the number of shells collected by four friends. Answer the following questions, based on the picture graph. What is Balu's shells + RaJ's shells? question_answer18) Look at the picture graph which shows the number of shells collected by four friends. Answer the following questions, based on the picture graph. How many Shells did Salma collect? 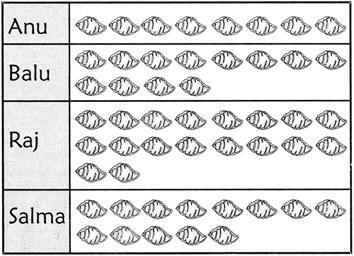 question_answer19) Look at the picture graph which shows the number of shells collected by four friends. Answer the following questions, based on the picture graph. How many shells did Anu collect? question_answer20) Look at the picture graph which shows the number of shells collected by four friends. Answer the following questions, based on the picture graph. How many shells did Raj collect?